Rediff.com » Movies » Shah Rukh Khan: The Lover Or The Superhero? Shah Rukh Khan: The Lover Or The Superhero? Aseem Chhabra wonders if Shah Rukh Khan's G.One will match up to his Rahul charm. There are two kinds of Bollywood lovers: The vast majority who are Shah Rukh Khan fans and eagerly await the release of his films, which appear in theatres near us, and others who may not like the star's work, perhaps even think he often overacts, but cannot deny his strong foothold in the world of Hindi movies. I fall somewhere in the middle, perhaps more in the first category, since I do go to see all of SRK's (as the star is often referred to by his fans and friends) films the weekend they open. I am drawn by the hugely-entertaining quality of most of his films, as much as by his seductive charm on the screen. I have interviewed Khan and have seen him at press conferences and that charm is very much there even when he is not being presented to us by the magic of cinema on a big screen. There are many images of SRK that I remember -- the precocious, yet lovable Raj Malhotra of Dilwale Dulhaniya Le Jayenge, who performs one of the more romantic Bollywood songs Tujhe Dekha To Ye Jana Sanam and one of the best wedding songs Mehndi Laga Ke Rakhna; the Rahul of Kuch Kuch Hota Hai (he was also Rahul in Yes Boss and Dil To Pagal Hai), who breaks Kajol's heart, through most of the film, while she speaks the film's best remembered and often repeated dialogue Kuch kuch hota hai Rahul, tum nahin samjhoge; or Aman from Kal Ho Naa Ho, who lip syncs the heartbreaking title song of the film. Like most SRK fans in the United States, I discovered his films while living in this country. I saw his early works, including the negative characters he played in films like Baazigar and Darr, as well as his serious and more meaningful works where he gave deeper and well nuanced performances like in Chak De! India and Swades. But it is the romantic SRK in a range of films -- often produced by Yash Raj Films or by Karan Johar's Dharma Productions that I connect with the most. I would like to believe that this is the SRK that many of his fans prefer to watch in North America -- the star who showed us Bollywood at its romantic best in films like Veer Zara, Om Shanti Om, and even Rab Ne Bana Di Jodi. That is the SRK that most of his fans in the US look forward to seeing on the screen -- a likeable romantic man who sometimes does not read his co-star's love for him (It nearly took him the entire length of KKHH to realise that he loved Anjali played by Kajol). That is the sure shot dependable SRK that we like to watch on the screen. I do not care for the statement SRK has often made -- he can perform those romantic characters in his sleep. It might be an easy job for him (which probably is not true), but he plays the romantic man with such pizzazz and in the old-world style that he is treat to watch, as he woos the hearts of his co-stars and his audience! But this weekend we are going to see a very different and an evolved SRK -- as a superhero in Ra.One! 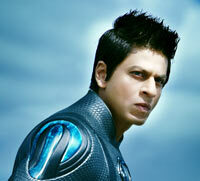 In director Anubhav Sinha's film, SRK plays the good super hero G.One about to save the world. The previews and song videos from the film give us sense that Ra.One is eventually Bollyood cinema, featuring fun dance items set to Akon's singing Chamak Challo and Criminal. And he definitely romances Kareena Kapoor, who last appeared with him in Don, but they have also worked in Asoka and Kabhi Khushi Kabhie Gham. Ra.One is a hugely expensive film, with much of the money invested on special effects by a highly-trained team of technicians from outside India. SRK has often stated that one day he wanted to make a film that he would watch with his kids with no reservation. Ra.One appears to be that film. SRK and his company, Red Chillies Entertainment, have taken big financial risks with the film and no one can predict how the film will fare at the box office. But given that he, as the star, has to maintain a certain image on screen and among his fans, I do not think he is going to risk changing that. 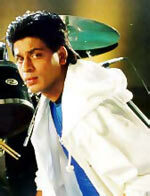 Ra.One's previews and song videos promise to show us a lot that we have not seen or experienced in a Hindi film. But I am hoping it will also have the loveable SRK with a golden heart who almost never disappoints us. I just cannot wait for Diwali day, when the film opens in theatres around the world.